moved south and began a ten year stint as a special education teacher working with emotionally disturbed children in a suburb of Atlanta, Georgia. During those years, when not in the classroom, Terry honed his skills working with the medium of graphite, drawing when time allowed and finally he experienced a very positive reception to his work at his first showing as part of a large scale group show, the Southeastern Wildlife Exposition in Charleston, South Carolina in 1990. That year, he decided to leave teaching and turn professional as a full time graphite artist. Since his graduation from art school, Terry has traveled extensively on the North American continent spending time in the Rockies, the western states and the mountains and coastal areas of western Canada. 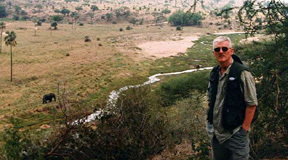 In addition, seven trips to eastern and southern Africa, primarily to the plains of the Serengeti and Nogorongoro Crater in northern Tanzania, the Nile in Uganda, the great expanses of the Okavango Delta in Botswana and the forests of Zimbabwe, have all added to his source file of reference material, sketch books and inspiration for his work. And to that end, translating all those memories and field experiences into finished works of art, Terry works exclusively in various grades of graphite portraying textural contrasts of wood, stone, water, animal hide and other natural elements, to bring depth, dimension and emotion to his works. Artists annual members exhibition, Art and the Animal and has had a number of works included in the recently published book, Where Elephants Go To Die, a book of poetry about Africa, its land, people and animals. 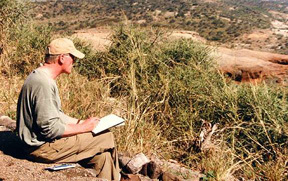 In the late 1990s, Terry served as Artist in Residence at the Blauvelt Art Museum outside New York City for two years, his residency culminating with the well received exhibition, Kalahari to Kilimanjaro in which his works on an African theme were spotlighted. In the summer of 2008, the Woodson Art Museum in Wisconsin hosted a solo exhibition of Terry's works under the title, 'Unknown Bridges'. That exhibition, comprised of 40 works, spotlighted the abstract nature of bridge structure juxtaposed with the softer, natural feel of the animal world. A companion book of the works included in that series was published in conjunction with the opening of the exhibition. And in 2013, the Woodson also honored Terry by naming him as their 33rd Master Wildlife Artist. In conjunction with the opening of their annual, internationally respected exhibition, 'Birds in Art', Terry's graphite works will now be added to the ranks of paintings and sculptures from the likes of Robert Bateman, Kent Ulberg, Tony Angell, Ray Harris-Ching, Roger Tory Peterson and Nancy How, to name but a few of the previously named Masters. His works have been included in the last eight volumes (2 through 9) of the ongoing series from North Light Books, Strokes of Genius: The Best of Drawing, and three of his works are also included in the recent private publication of American Coastal Art: The Collection of Charles J. and Irene Hamm, which spotlights their highly prized collection of 18th through 20th Century works with a marine/maritime theme. Since the opening of the 21st Century, Terry has resided in central Maryland surrounded by new and exciting inspirational scenes that have slowly begun to work their way into his studio time, reflected on this site by the appearance of barns, new landscapes and the more domesticated side of the animal kingdom.